Oops! My SkyDrive Browse task package was missing two files! That's the problem with not testing it thoroughly enough! I've updated to v1.1.1 to remove some unnecessary files and add two required ones. Sorry about that! I love the task-based way of handling platform features on Windows Phone. It works great for choosing or taking photos, sending email/SMS, or taking a user to Marketplace. One inexplicable omission is that you have no way to let a user select files from SkyDrive, even though Windows Phone is supposed to be connected to the cloud! 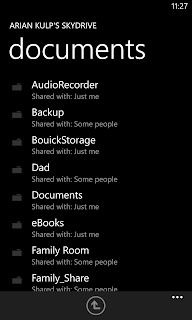 To remedy this, I've created a fairly simple task-based SkyDrive browser for selecting files. I made it look like the SkyDrive browser used by Office Mobile 15. 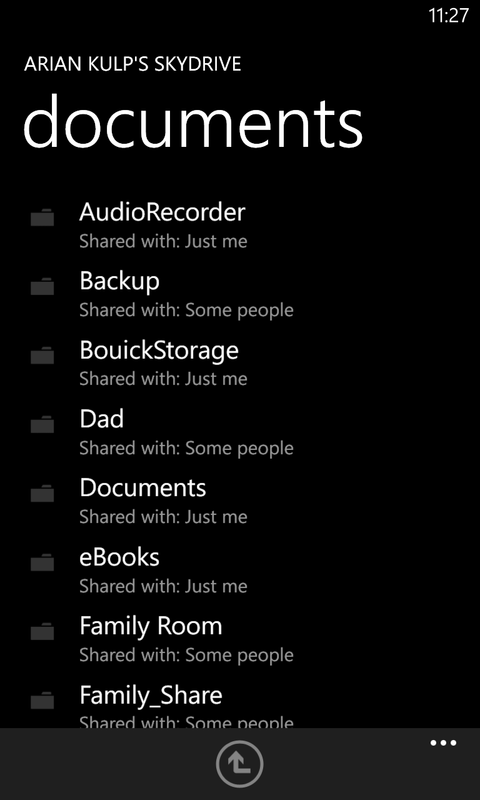 This displays the files and folders at root, along with sharing information. You can tap a folder to enter it, the "up" button to go back a folder, or a file to select it. Selecting a file passes it back to the caller (your app) so you can open it or do whatever you need. The library currently supports English, Spanish, German, and French. Use NuGet Package Manager in Visual Studio to reference ArianKulp.SkyDrive.BrowseTask (direct link below). In your app, integrate Windows Live LiveClient authentication. Create the SkyDriveBrowseTask object and pass it the LiveClient. This is required as it assumes that you are already handling authentication login/logoff in your own way. Handle the Completed event to deal with the selected file path (or canceled operation). Looking for help bringing your Windows Phone app to market? I'm using the new Google Helpouts platform to provide one-on-one help for Windows Phone code, navigation, localization, XAML, databinding, and more! Check it out and maybe I can help you! Google Helpouts is a cool new platform that allows people to offer services over video/chat for a fee. This could be things like exercise coaching, language lessons. or even health consultations. I've decided to offer code coaching for Windows Phone. If you are struggling with a project and would like some assistance, you can use my Helpout to share code over screen sharing while talking and using the webcam. Until the official rollout, all charges will be refunded, but it gives a way to test out the system, and test out the providers. I have one invite code for the person with the best comment! Just give me a quick reason why you would like the code. With the invite code, you can use my hangout, but you'll also see all of the other ones.